How to? Frozen session tab with "ERROR: The file is either empty or does not contain the valid choices." I've been seeing this error here and there, and I'm wondering if there's a way around it? ERROR: The file is either empty or does not contain the valid choices. Take Command itself is not frozen, and restarting the tab is possible. I'm wondering if there is a way to prevent this, or to get around it. Does the "ant" (or whatever it's called) program terminate (does the TCC prompt return)? If "no", I doubt TCC/TCMD can do anything about it. I've run these tasks thousands of times in TCC/LE, and these tasks always exited. In Take Command, they consistently freeze like this. I can't honestly say every time yet, but a lot. That error message isn't coming from TCC or Take Command. 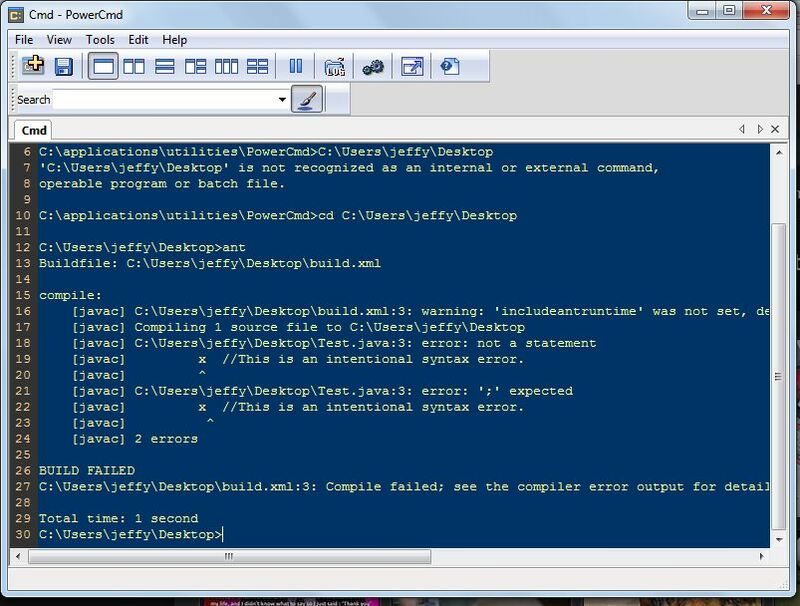 Is there any way beyond Ctrl+C, or closing the tab entirely, to unfreeze this, and get back to the command prompt? Do you see the same issue if you detach the tab before running the program? Same issue. Never tried detached before. So.... this program gorks with an error message in the full version of TCC, but works in TCC/LE...? That's very odd. I'm not clear on what you're doing that produces this error. What is the last command that you type before seeing all this gribble? Does that command launch a program or a batch file? (The WHICH command will tell you.) If it's a batch file, are you able to post it here? The only time I've seen something like this happen before is when the console app changes its console buffer. There's no way that TCMD can detect that (or get a handle to the new buffer), so you end up with what appears to be a "frozen" display. Okay. I can faithfully reproduce it, but unfortunately it requires that you install the JDK and Ant (http://ant.apache.org/). Once Ant is installed, use the two files I pasted below. Save them in the same directory, and execute "ant" from that directory, via Take Command. <javac srcdir="." destdir="." listfiles="true" includeantruntime="true"
It would seem that the app in question (ant?) is hung ... won't exit. If it (the hung app) responds to Ctrl-C, that's the best scenario I can think of. Does Ctrl-C terminate the hung app and return the TCC prompt? And, as I mentioned before, it's also worked in TCC/LE for years. I get the same results in every shell I've tried. 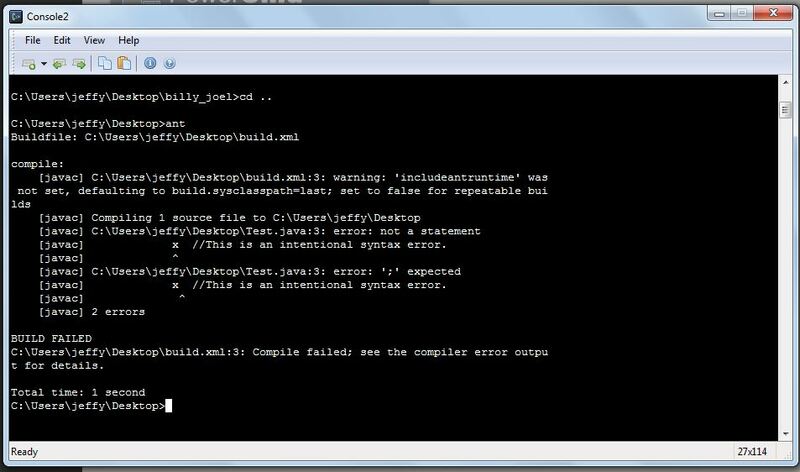 C:\Ant\build.xml:4: Compile failed; see the compiler error output for details. If you're seeing different results in standalone TCC versus TCC/LE, it is almost certainly because they are configured differently. Things to look for: different aliases, different environment variables, different special characters (SETDOS), and different .INI options such as CmdVariables, DelayedExpansion, DuplicateBugs, NoClobber, and PathExt. Charles, were those tests in TC tabs? Here are screenshots of all of my customization settings in Take Command. I'm not spotting anything. What does WHICH ANT report? would posting the screens of TCC-LE be a good idea? I uninstalled, eliminated the AppData/Local/JPSoft directory and my TCSTART.bat file, restarted my computer, installed Take Command again, and the same thing is happening--frozen with "invalid choices". This happens both in a tab window, and in a "detached" window. I don't know if I've said this, but I'm on Windows 7, 32 bit. I just noticed that "C:\applications\utilities\tcc_le\" is in the path, but that directory is empty. I uninstalled TCC/LE entirely, as it was causing conflicts with Take Command. I should say, the directory isn't empty--it doesn't exist.